The Index Browser offers a search interface that allows you to browse the index content and to easily find any indexed document. 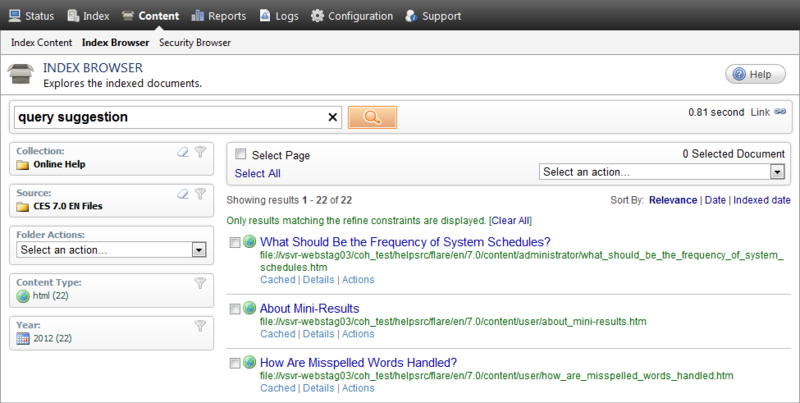 In the Administration Tool, select Content > Index Browser. Tip: When you are in a source page, you can also conveniently access the Index Browser page by clicking Indexed Documents on the toolbar. In the search box, optionally type one or more keywords that the documents you are looking for may contain, click the search button, and then review the search results. When needed, use the available facets to narrow the search.